Alright! As promised, I have some colorful, fun, and easier-than-you-think watercolor tutorials coming your way. 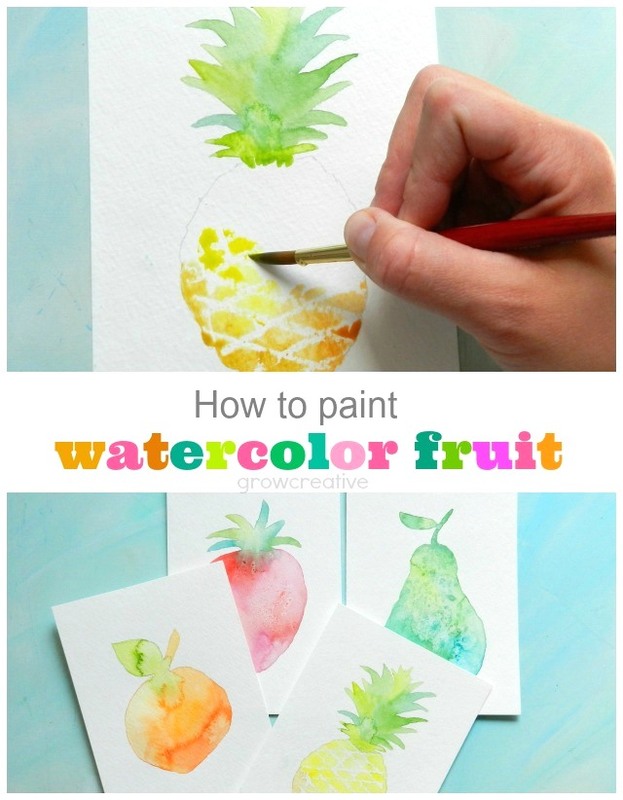 So stick around to learn how to paint a pear, a strawberry, a peach, and a pineapple in watercolor! These are all painted in silhouette style- so you don't even have to worry about shading here. 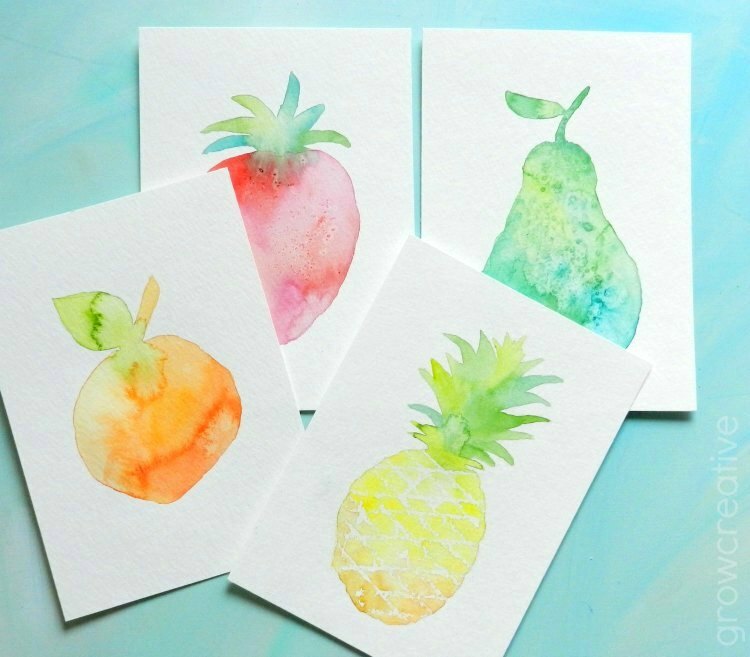 I even have free templates for all four of these fruits- so just click the link below and print. They are all formatted to fit a 5x7 piece of paper. If you want to download these and crop to your own dimensions- feel free to do so. We'll start off with my favorite fruit- the pear! I love it so much because of it's shape. It's a beautiful shape. Step 1: Transfer the pear template to your watercolor paper by placing the template under the watercolor paper, holding it up to a lighted window and lightly tracing in pencil. It's important to keep the pencil light so it doesn't show through the paint later on. Step 2: Pick two colors. Mix up shades of each on your palette. 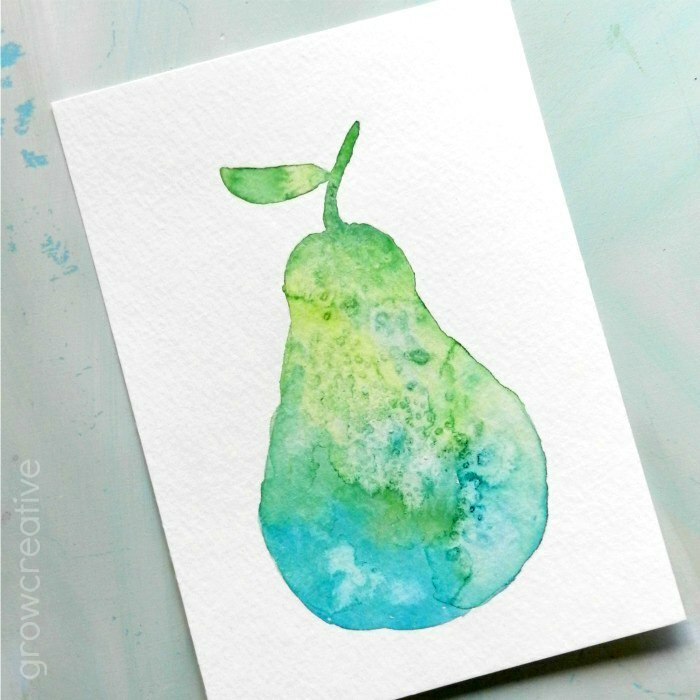 Fill in the pear silhouette on your watercolor paper by alternating colors in different areas of the pear. The colors blend and mix together better when you have more water mixed in with the paint, but don't dilute the paint too much. You want these colors to stand out. Work quickly with the paint. Don't let it dry out. You need to keep the paint wet for the next steps. Step 3: To add some fun texture, you can try the water dripping method. 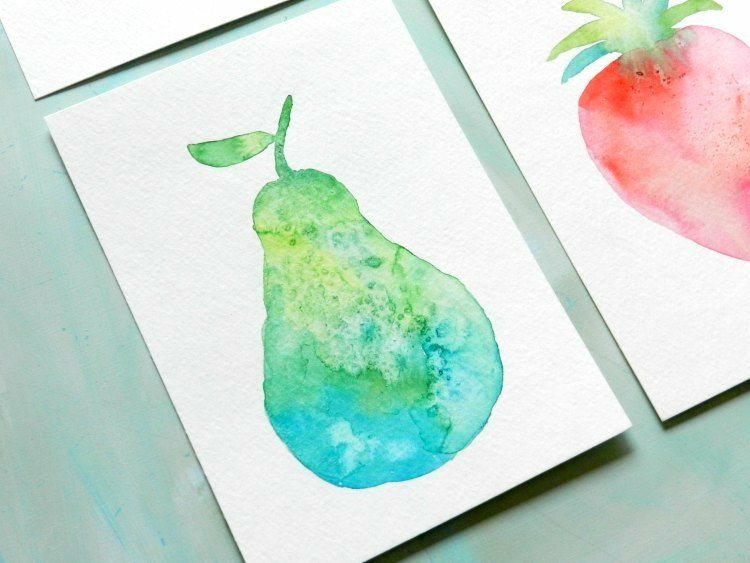 You can check out my Watercolor Textures post for detailed instructions on that, but it's basically just dipping a clean brush in water and dropping the water in spots on the already wet paint on the pear. Step 4: Before the paint dries, sprinkle salt on it. Then let it dry completely. Once the paint is totally dry, brush the salt off and admire the awesome textures left behind! And there you have a beautifully textured pear silhouette! What a gorgeous tutorial! I love playing with watercolors but have yet to try the salt method you shared. I've got to try that. Definitely pinning this. :) Have a great day! Love this! Tried the pear and it was super fun! Thank you for these tutorials, you make it look so easy!